The major factor in the morbidity and mortality of cancer patients is metastasis. There exists a relative lack of specific therapeutic approaches to control metastasis, and this is a fruitful area for investigation. A healthy diet and lifestyle not only can inhibit tumorigenesis but also can have a major impact on cancer progression and survival. Many chemicals found in edible plants are known to inhibit metastatic progression of cancer. While the mechanisms underlying antimetastatic activity of some phytochemicals are being delineated, the impact of diet, dietary components, and various phytochemicals on metastasis suppressor genes is underexplored. Epigenetic regulation of metastasis suppressor genes promises to be a potentially important mechanism by which dietary components can impact cancer metastasis since many dietary constituents are known to modulate gene expression. 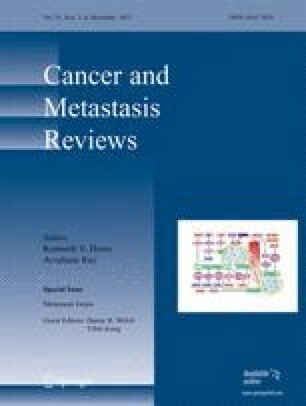 The review addresses this area of research as well as the current state of knowledge regarding the impact of diet, dietary components, and phytochemicals on metastasis suppressor genes. This work was supported by the NIH grants R01-AA-07293 and K05-AA-017149. The author also acknowledges the helpful suggestions and editing expertise of Kathleen Smith-Meadows. Kushiro, K., Chu, R. A., Verma, A., & Nunez, N. P. (2011). Adipocytes Promote B16BL6 Melanoma Cell Invasion and the Epithelial-to-Mesenchymal Transition. Cancer Microenvironment. doi: 10.1007/s12307-011-0087-2.